€/$/£15 free, no deposit required on signup! Deposit Methods: CLICK2PAY, ClickandBuy, EcoAccount, Maestro, NETELLER, paysafecard, Poli, UseMyFunds, Visa, Visa Electron, MasterCard, Skrill, Ukash, Check by Mail. Jurisdiction: United Kingdom, Isle of Man. The term 'gone fishing' is synonymous with vacations universally. 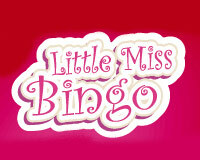 At GoneBingo, it is our mission to make 'gone bingo' synonymous with online bingo fun and entertainment. 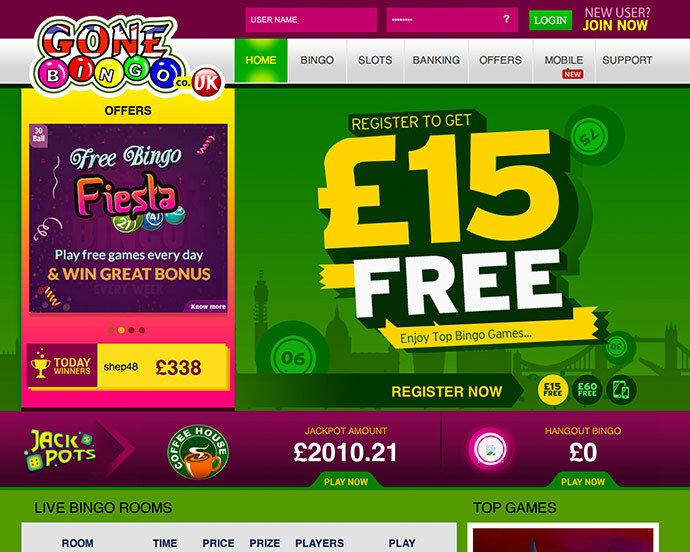 Our goal is to provide players with 'The Ultimate Online Bingo Experience' and be the world's largest bingo room. We are commited to building loyalty and value for our bingo players - everytime. It's time to 'Go Bingo! Get .... Set....Play and Win!! Make sure you stop by the Chat Rooms, the Chat Masters and roomies are friendly and fun and the bingo games are awesome. Win tons of FREE BB's at the 24/7 Chat Games. 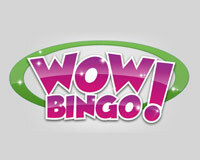 With the side games, you can play your favorite slots without missing out on Bingo and your chat buddies. The website is 100% owned and operated by: CHELBIS COMPANY LIMITED, 35 Theklas Lysiotis Str Eagle Star House Limassol 3030 , Cyprus. Gone Bingo does not accept players from the following countries: Ivory Coast, Libya, Mayotte, Nigeria, Somalia, South Africa, Sudan, Zimbabwe, Afghanistan, Armenia, Azerbaijan, Bangladesh, China, India, Indonesia, Iran, Iraq, Israel, Japan, Laos, Malaysia, Myanmar, North Korea, Pakistan, Philippines, South Korea, Syria, Thailand, Turkey, Uzbekistan, Cuba, Guadeloupe, Martinique, Puerto Rico, Saint Barthélemy, Saint Martin, United States Virgin Islands, Argentina, French Guiana, Albania, Belarus, Belgium, Bosnia and Herzegovina, Bulgaria, Croatia, Cyprus, Czech Republic, Denmark, Estonia, France, Hungary, Italy, Kosovo, Latvia, Lithuania, Moldova, Montenegro, Netherlands, Poland, Romania, Russia, Serbia, Slovakia, Slovenia, Spain, Ukraine, Canada, Saint Pierre and Miquelon, United States, American Samoa, Australia, Cook Islands, French Polynesia, Guam, Nauru, New Caledonia, Northern Mariana Islands, Réunion, United States Minor Outlying Islands, Wallis and Futuna.